If you are an experienced driver, you probably understand the benefits of driving luxury sedans. The new Mercedes-Benz E400 series features design dynamics that are sure to excite your personal notion of safety, ease, and comfort. The E400 series allows maximum driver control with the 4Matic all-wheel drive system. This independent wheel construction provides maximum torque with ultimate control in any weather condition. It is perfect for high speeds on a slippery freeway, yet conveys security on uneven rural roads. 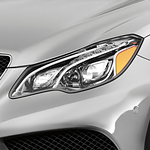 At more than 4,100 pounds, the E400 series sedan is heavier than traditional Mercedes-Benz models. This curb weight is extremely useful in providing the owner with the feeling that this luxury model can navigate safely and securely on today’s modern roads. Of course, the Mercedes-Benz E400 series has the obligation to prove its power. It features the 9G-Tronic 9-speed automatic transmission. This engine can achieve 60 mph in five seconds, yet it boasts a 28 mpg fuel efficiency. The experts at our dealership can help any experienced luxury driver discover why the Mercedes-Benz E400 series is one of the best sedans in its class. Schedule a test drive to discover how your time on the road can be improved.